The debate goes on, whether we should keep our cats inside or not. 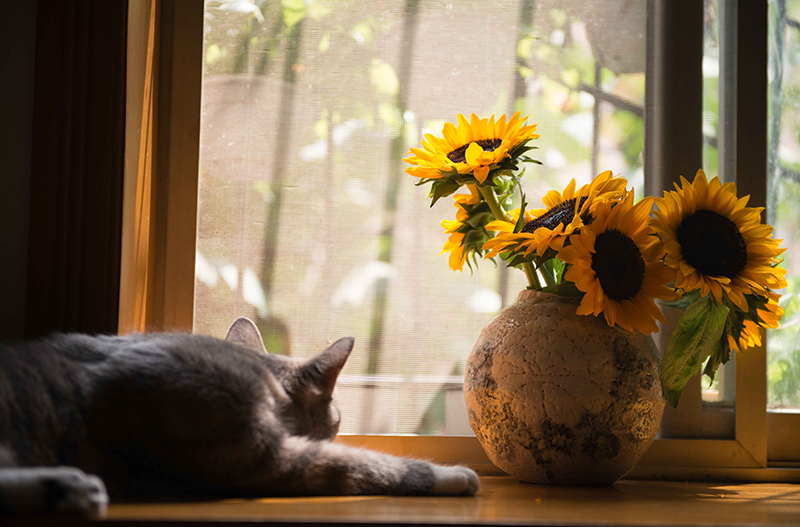 With all the dangers that the outside has to offer, and the high percentage of deaths from these dangers, many consider it best to keep our cats indoors. But we cannot ignore cat’s natural instincts to hunt and what the effects of not acting on this may be. We’ve put together a list of things you can do to keep your cat mentally and physically stimulated, in order to have a happy cat. Watching the outside world will brighten your cat’s day. Allow them to get excited over the birds going by. Give your cat something to be distracted and entertained by. Cats need to jump. It’s part of their natural instincts. They will often jump to high places to feel comfort and for entertainment. Create new places in your house that your cat can jump to. This can include shelves and cat trees. Or get creative and build your own levels. Grasses which are full of chlorophyll are packed with antioxidant vitamins, minerals, and other nutrients which have massive benefits on a cat’s health. They also help to control hairballs by improving digestion. Challenge your cat’s natural instincts by hiding their toys. Make it harder for your cat to play by providing them with a hunt first. Not only will this provide them with the mental stimulus they require, it will prevent them from becoming bored and complacent with the same old toys. It is well known that cats LOVE running water. Bring joy to your cat by providing them with a water fountain to drink from. This will switch up their usual way of drinking and feel more natural to them. It is responsible to keep your cat indoors to ensure their safety. But it is important to acknowledge their natural behaviours and keep them stimulated. Balancing the two will ensure a healthy, happy cat. The opinions expressed here are the personal opinions of the writer. Content published here does not necessarily represent the views and opinions of Petplan.